When I got the invitation to go whitewater rafting in Columbus, Georgia, my first reaction was: Huh, Columbus? My knowledge of Columbus is very limited. Aside from traveling to visit family at Fort Benning or traveling through the city to visit family in Alabama, its always been a quaint, quiet town to in my mind. Never in my wildest dream would I imagine the city to be an adventure destination – right in the heart of downtown no less. I made my appointment for my rafting experience with Whitewater Express. If you’ve ever gone kayaking or whitewater rafting on the Oconee River the name should be familiar, they provide equipment, classes and experiences there, too. According to the reservationist the river goes from mild, with a maximum of class II rapids in the mornings to wild – a combination of class II through V rapids as the day progresses. I chose 3:00 P.M., a sweet spot between the two extremes. I arrived early and took the time to explore Uptown Columbus. The community runs alongside the river and is the home of Columbus State University that sits just off the bank of the Chattahoochee. Two blocks away from the river is really where things were really happening. I took a stroll down Broadway Street, a postcard perfect example of old and new. Massive shady oak trees and art installations divide this wide city street providing familiar southern charm – and shade to peruse the local retail and eateries. I found a literal glut of boutique sandwich shops and coffee spots with outdoor seating, that provide free wi-fi, and are pet friendly. A little hungry and thirsty, I made my way to Smoke Bourbon and BBQ, a craft-inspired barbecue joint and cocktail bar located on the corner of Broadway and 11th. The restaurant appears to be a Sunday brunch staple as large groups waited for seating both indoors and out. Since I was alone, I opted to sit at my favorite spot – the bar and try some of their non-traditional offerings. I decided on the Gnocchi and Brisket – an inspired take on meat and ‘taters. The dish was rich and rustic with tender potato dumplings tossed in brown butter and topped with a heaping portion of Smoke’s signature beef brisket. I paired my meal with a Gin Basil Smash, a lush mix of citrus and botanicals that was sour, savory, and refreshing. With my belly now full, it was time to face the rapids. I didn’t have a party to share my raft so I was added to a large party of friends and family celebrating a birthday. The tour guides got us geared up and after a quick lesson on safety we boarded a bus and drove two miles up the river to North Highlands Dam. The dam releases water throughout the day that increases as the day progresses. By the time we hit the water the flow was around 975 CFS (cubic feet per second) but you don’t see the impact of this until you approach the rapids. We boarded our rafts and headed out. My raft had two guides: Green Bean a tour guide trainee, and Ian, a guide manager and as we started our lazy float, I began to question how much of an adventure this would be. We had not hit any rapids at this point and the picturesque vistas had my party more relaxed then we should have been. That changed when we approached our first rapid. As we paddled around an outcrop of rocks we hit “Ambush,” a class II rapid. Green Bean explained all rapids have names. It’s a way for water sportsmen to identify for training and competition. Ambush is a two-foot dip with waves that hit us about 16 inches above the raft. The entire boat was doused, and we laughed at accomplishing the first challenge of the day. We paddled on, introducing ourselves and making small talk with Green Bean as he talked about the Chattahoochee River, scenic landmarks and upcoming rapids we experienced. Midway through our tour we made it “Lazy Daze,” a lull spot where we were encouraged to jump in a back float or “nose and toes” for a bit and enjoy the water. After floating on our backs for 15 minutes we boarded our rafts again and pushed off to head to our next set of rapids. Forty minutes had passed and up to this point the rapids were relatively tame. At this point we had only encountered class II rapids and our assumption was this would be the standard the remainder of the trip. We were wrong. Our next rapid was “Wilson’s Run,” a class III rapid. We entered the rapid, paddling hard and bracing for the wave crash, the splash was nearly 30 inches above the raft and we were jostled about. Our boat was turned about, and we had to learn on the fly how to right the direction of our boat before the next rapid. We were the last boat in our chain so we heard combinations of screams and laughter ahead of us as they hit the rapids, but nothing really prepares you for experiencing the rapids yourself. GOING WITH THE FLOW: The rapids that run through downtown Columbus, Georgia range from classes II through V. Shown here, Whitewater Express guides take a group of adventurers through a class IV rapid. Photo by Edward Adams. Our final rapid was “Heaven’s Gate” a class IV rapid. I must admit I had reservations about this one. 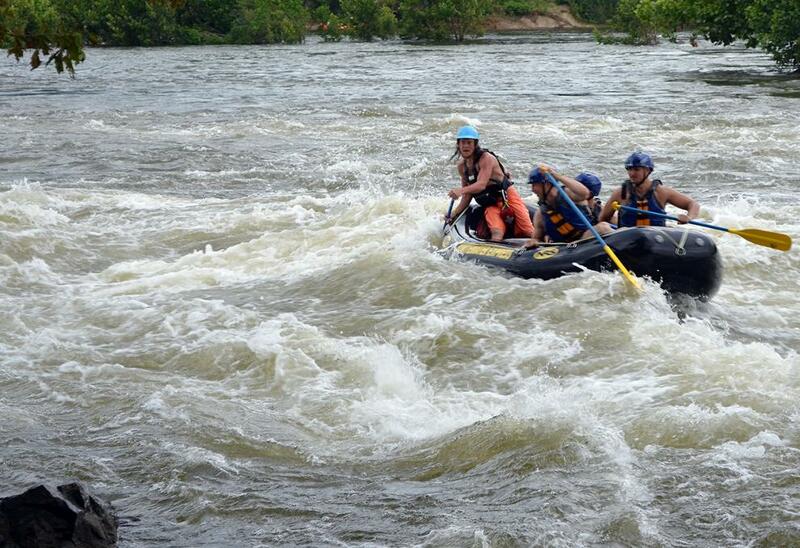 Unlike our other rapids, this one put our party on edge. The water churned from a three-foot drop and the as we approached it, our boat sped up and the roar was near deafening. We dug in, paddling hard and fast and as we hit the first wave three members of my party flew off the raft. Time stopped as I watched them fly into the water. Me and the remainder of the crew worked to tackle the rapids while Ian jumped in to assist the rest of the party who were battling the rapid in the water. Our boat was too light, and we capsized. As scary as this was being thrown into the Chattahoochee with four-foot waves jostling you every which way its important to remember your training: take a deep breath and “nose and toes” get on your back and float your way through the rapid. I broke surface midway through and rapid and caught my breath before the next wave hit which pushed me under. I kept saying to myself, “nose and toes – nose and toes,” and made it through to calmer water. When I opened my eyes again, a safety guard (a safety team accompanies all the rafts in case of emergencies) was pulling on top of his kayak and took me back to the where we assisted the remainder of my group back in the boat. We lost all but one of our oars, and two members of the group lost their glasses. I lost my left aqua sock. CLASS ACTION: Whitewater Express guide takes an experienced group into class V rapids in Columbus, Georgia. Photo by Edward Adams. As we floated to the docking spot roughly 50 yards from Heaven’s Gate, we all shared our moments; our thoughts, and how scary and thrilling being thrown into a rapid was. We all vowed to do this again soon as we all wanted to conquer this rapid like we tackled all the other before us on the journey. I left my group who were at this point jumping off into the river as a final nod to their birthday celebration. With one shoe on I partly hopped my way back to the Whitewater Express Center to avoid the hot pavement finding any grass and sand I could find along the way to cool my feet. I got dressed, thanked and tipped Green Bean for the experience and began my 90-minute trip back to Atlanta. I was exhausted and exhilarated. Never in my wildest dreams could I have known Downtown Columbus was a destination for outdoor thrill seekers. Along with whitewater rafting, Whitewater express has kayaking; zip lines excursions across the river into Phoenix City, Alabama; paddle board rentals; bike rentals, and fly-fishing classes and equipment rental. As of late I’ve become an evangelist of sorts touting the amazing adventure through pictures and telling my capsizing moment while shooting rapids in Downtown Columbus. While my friends still can’t imagine the town most Atlantans think of as rural and uninteresting, I can’t wait for them to discover for themselves it is anything but boring. Smoke Bourbon and BBQ, 1047 Broadway Columbus, GA 31901. 706-221-9889. Open Mon. – Thurs. : 11:00 AM – 9:30 PM; Fri. – Sat. : 11:00 AM – 10:00 PM; Sun. : 11:30 AM – 5:00 PM. www.smokebourbonandbbq.com. Whitewater Express, 1000 Bay Ave, Columbus, GA 31901. 706-321-4720. Open daily 8:00 AM – 6:00 PM. www.whitewaterexpress.com.